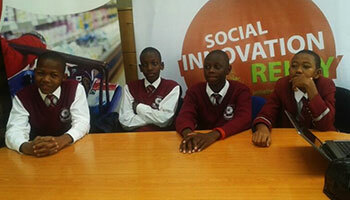 Malre Group from Kenya are the winners of the Social Innovation Relay, a global competition organized by Junior Achievement, in collaboration with HP and the Pwee Foundation, that challenges secondary school students to develop an innovative business concept that addresses a social need. Under the guidance and support of an HP e-mentor, the team developed a mosquito trap for the low income earners (video link). The runners-up in the competition wereGreen Barriers from USA for their innovative mechanism to ensure that trees successfully mature allowing them to tap into deep layers of groundwater that would sustain them for the rest of their life; and Sonder, from China, who developed an app that enables people to experience the charm of their cities. As one of the judges explained, "As a judge, I found the task of selecting only a few venture a very difficult one. I was thoroughly impressed by the contestants' audacious ambitions for eliminating such difficult social and environmental failures. One would expect this level of ambition to emanate from global executives and corporate boardrooms, not high school students from classrooms! What inspired me the most was the degree of preparation, attention to detail, and level of empathy displayed by competing teams who competed fiercely to find innovate solutions to neglected social and environmental challenges. I feel the world may be in better hands once these leaders come into decision making roles." Soushiant Zanganehpour, Strategy & Special Projects Consultant - Skoll Centre for Social Entrepreneurship Saïd Business School University of Oxford. The winners will join the Junior Achievement-Young Enterprise Europe (JA-YE Europe) Alumni Conference in Finland in September 2014. Today’s job market is more competitive than ever, and employers expect 21st-century technology and entrepreneurial skills from the next generation of employees. Unfortunately, many students around the world do not have access to the resources they need to develop in these areas, putting them at risk of unemployment before they have even entered the labor market. The Social Innovation Relay seeks to close this gap by bringing innovative technology and hands-on education programs to schools, equipping students with the technological and entrepreneurial skills they need to succeed in school and beyond. Nearly 2,500 teams around the world registered for this year’s relay. 18 teams competed in the final round of the competition. “I’m proud to see the impact of the Social Innovation Relay, having reached more than 116,000 students in 18 countries in the past four years! Educating a digitally native generation while tapping into their entrepreneurship potential to create socially responsible business ideas is our way of contributing to their future employability,” says Caroline Jenner, CEO JA-YE Europe. The top 20 teams in each country were paired with HP employee mentors who helped them to bring their concepts to life, coaching the student teams through both online and face-to-face mentoring. The Social Innovation Relay is aligned closely to HP’s online business and IT skills training program, HP LIFE e-Learning. Part of HP Living Progress, HP’s vision for creating a better future for everyone through its actions and innovations, the program’s social entrepreneurship module is a cornerstone of the Social Innovation Relay content. Junior Achievement and HP have worked together for 20 years on youth-focused programs, enabling thousands of students to receive real-world skills and hands-on training that focus on entrepreneurship and ICT. HP plays an active role in these programs and goes beyond traditional corporate sponsorship by not only donating funds but also tapping into its vast technology expertise and mobilizing members of its more than 300,000-employee workforce to participate via mentoring and volunteering. “I am impressed by the range and quality of concepts in this year's SIR, and the excitement and passion of the teams. As Pwee Foundation, I am privileged to be a judge this year, and keen to select a handful of team's concepts to bring to reality. Let's encourage more youths to creatively solve the social challenges around them with an entrepreneurial and innovative spirit,” said Benjamin Pwee, Founder Pwee Foundation. The Pwee Foundation will provide the Global Finalists whose businesses show the most potential with ‘SIR concept to reality’ opportunities. Selected teams will benefit from coaching to develop their business idea into a viable business plan. The teams will also have access to fund-raising opportunities and resources to get their social enterprise off the ground. The Pwee Foundation will oversee the incubation of the business from concept to reality. The Social Innovation Relay was launched in 2010, and over the past four years more than 116,000 students and 1,000 HP mentors from 18 countries have participated, submitting their socially innovative concepts. For more information on the 2014 Finalists, go here.